More than a drink, coffee is a ritual. Sleepy-eyed in the early morning quiet . . . we follow a familiar and comforting routine. After a few minutes, the coffee is ready and hot. Grab your mug. . . . your favorite mug, the mug, the ritual mug. The vessel for the ritual of waking to a new day. More important than the brew is the vessel. I didn’t understand the importance of this until I spent time in France. There is no better coffee to be found; but, I needed a mug for coffee that I made in my apartment. Not pretty. Not porcelain. Not delicate. Not small. A real mug. I searched for a mug with the proper weight, ample size and simple. It took days to find a mug that was adequate. I settled for a mug from England that was very close. Handsome it was . . . over time, I learned to appreciate this mug. But, I was disappointed when it did not survive the journey home. I was not the first to need a mug that could make a long journey. The armed services especially the Navy looked for mug that would “work” on a ship. The necessary characteristics were heft and stability – Victor produced the mug needed by the Navy. The porcelain produced by the Victor Insulator Company in New York was used to ground electrical wires. 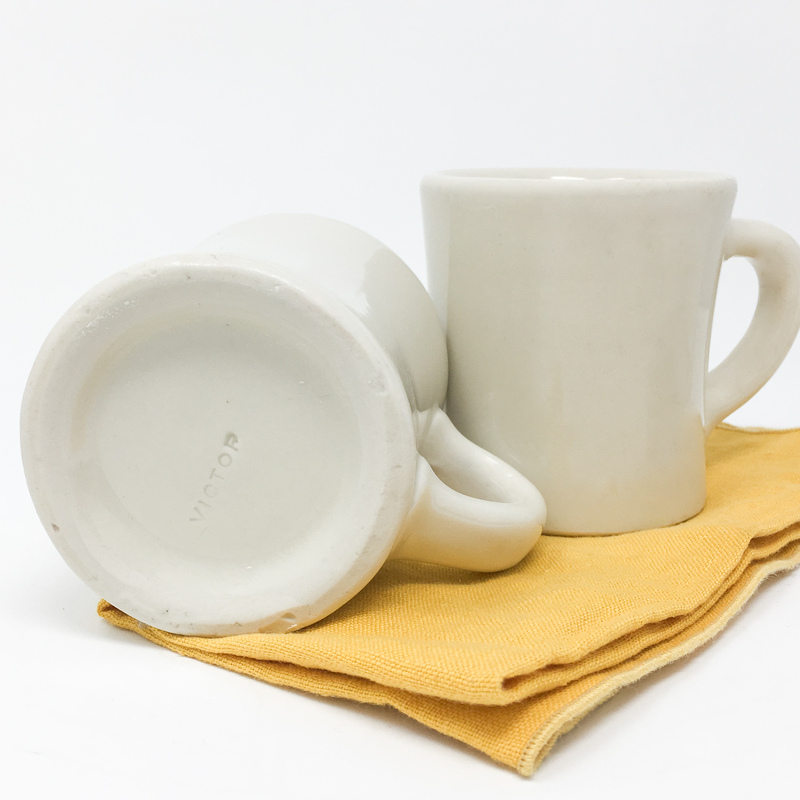 Heavy duty thick ironstone that also keeps coffee warm for a bit longer. I have read stories about men in World War II giving their mugs to those who asked. They were in demand. Hopper painted a diner scene with the familiar white mug. In the cartoon, Beetle Bailey, there is the white mug. And I have seen the Victor mug in quite a few old films. Stay tuned to see a few of our Victor Mugs in the new film, Midway. Certainly a film about a critical Navy battle would not be complete without a Victor Mug! We have sent Victor Mugs to buyers all over the world. This morning a Victor Mug was sent to North Carolina and Germany. We have mailed them to Saudi Arabia and Istanbul. Hong Kong and Australia. We have even sent them to sailors on Navy vessels in the Pacific. Some days, I have the crazy idea that peace in the world is possible. If only we could sit with a cup of coffee in a Victor Mug and talk. There is a spirit in the thing itself . . .
Notice the dings on the bottom rim; but yet, the mug did not break. It survived to see another coffee break! You can see our Victor Mugs – some with green lines – in our Etsy Shop. Hmmmm, I said, this looks like spam. Quickly, I clicked log out and returned to my real work. Later in the day, there was another notification from Etsy about a convo. 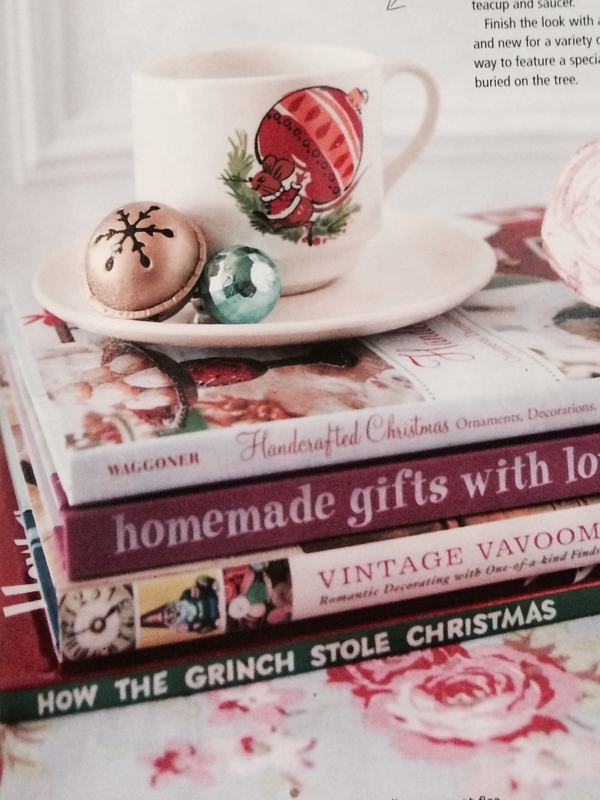 I am gathering materials for a vintage Christmas photo shoot to be featured in Romantic Homes magazine. 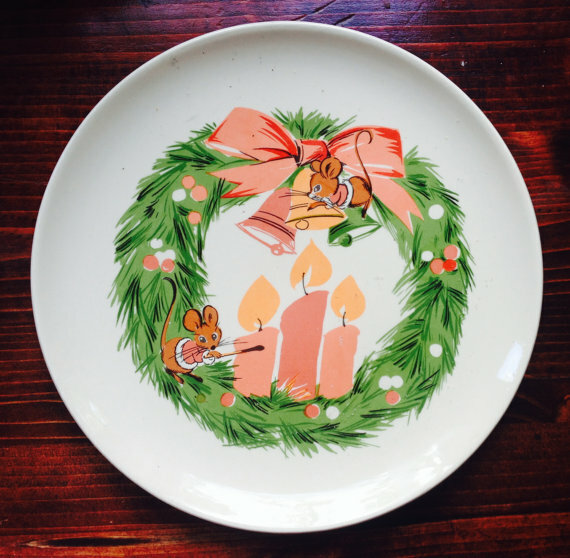 Would it be possible to use your vintage set of dishes that feature a mouse? They are the perfect colors and will complete our vintage holiday decorating guide. Your shop will be credited and I will return them to you promptly. Please let me know today as I am on deadline. Well, I said, maybe this is legitimate. I texted my closest advisors for advise (my internet savvy children). I paraphrase, The editor had asked that I send a set of china for a photo shoot for the Christmas issue. it simply would not happen. Well, maybe I should just forget about it and text her that are not interested. the story editor (found her byline in previous issues) and the address that she had sent. It all checked out. the expected date of return. I figured, what the heck anyway – they are concerned about losing a few dishes?!? Really! Then they really do not understand how many dishes there are in the barn! The package arrived in a timely manner with the pink pastel mouse on a green Christmas wreath. . .Sarah Jane also included a note thanking me and remarked that the mouse was “just the right touch” . . . The whole episode was quickly forgotten . . . at first, I refused to tell anyone – JINX. A few weeks ago, my daughter asked if I had any news and then suggested that I contact the editor. But, I did not follow her advise (a big mistake) . . . and I realized that I had really pushed it way back in my mind – as in nearly forgotten! I then re-listed the dishes on Etsy! Late last Thursday, I noticed that there were lots and lots of people visiting putnamandspeedwell.com. And we had a lot of new orders – it was the weekend of the Halloween Block Party and a birthday party for my beautiful little nieces! In the middle of the night, the cell phone continued to vibrate and then, the familiar sound of a vintage cash register, CHA-CHING. or on Etsy. 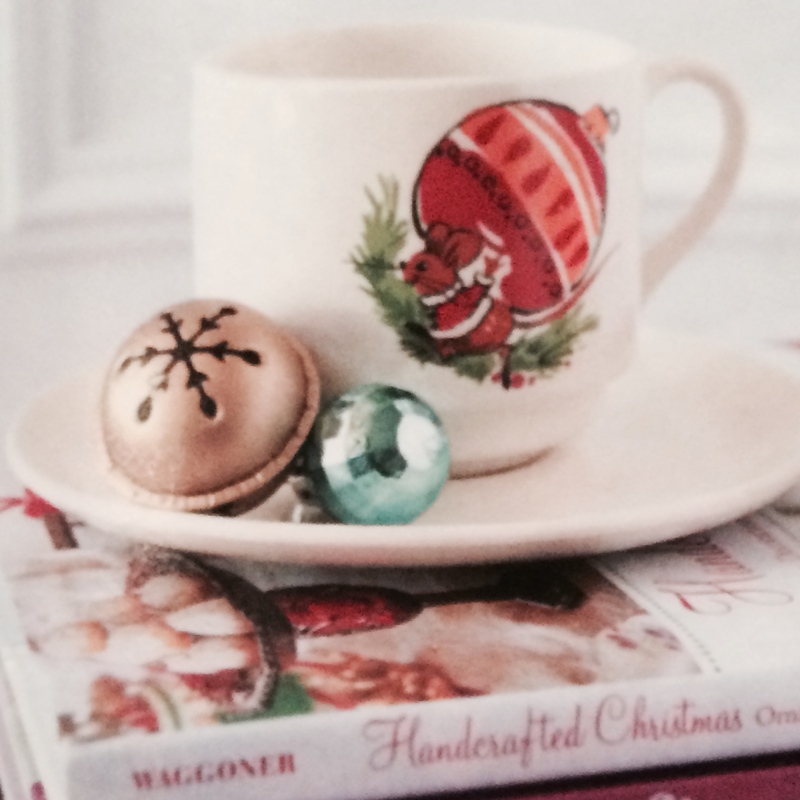 One of the hot items was dinnerware decorated with a Christmas Mouse. and green on a white background. In a note to one buyer, Carol, I mentioned that the Christmas Mouse had quite an adventure – he travelled all the way to California for a photo shoot. So maybe, “your plates will appear in the magazine.” Carol replied, “I saw the set in Romantic Homes that’s why I looked at your Etsy site to see if you had any left. I was lucky!” Mystery Solved! And then a big whoop . . . . YAAAA HOOOO! Cowabunga . . . YES! Christmas, is from the Putnam & Speedwell Etsy Shop. But still there is a mystery. Notice that Sarah Jane nor I mention the name of this pattern! Looking at the bottom of the plate, my hunch is that it was manufactured by Royal China. The colors lead me to think that it was produced mid-century. But still, I do not know the pattern name. So, we will offer a 25.00 gift certificate at Putnam and Speedwell. That’s right. If you know the name of this pattern, you can let me know with a comment. Thank you Sarah Jane! Carol, thanks for solving the mystery! Thank you Etsy. for making it easy to access a large, very large, audience. Thanks also to my family . . .